A section of the M4 bus lane has been removed overnight. Work to replace road signs and markings and create a revised road layout on the London-bound carriageway, near Heathrow Airport, began at 2200 GMT on Monday. The bus lane, introduced in 1999, was rarely used and not always enforced and proved unpopular with many motorists. A three-mile (4.8km) stretch of the motorway was altered overnight, leaving a further half-mile (0.8km) of the bus lane to be removed. The bus lane is to be restored for the London Olympics in 2012, after which it is likely to be scrapped altogether. The M4 eastbound, between junctions two and three, will be closed overnight for three nights from Tuesday, and again for four nights from 22 November, to continue work on road signs and markings. Diversions will be in place. One lane of the M4 westbound, in the same place, will be shut on Tuesday and Wednesday night to create a safety zone while work is carried out on the central reservation. 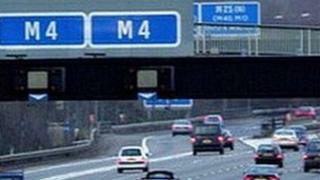 The Highways Agency said said the entire project was likely to be completed by mid-December. Transport Secretary Philip Hammond has expressed his intention to scrap the lane permanently after the London Olympics. Only buses, licensed black taxis and motorcycles - making up about 7% of London-bound traffic - had been allowed to use the bus lane.